It seems everyone knows everything about anything these days. There is the “perfect” product for this, the finest doctor for that. But when it comes to your eyes, there are a lot of ways to take care of them naturally––naturally being the best. Here are five ways to improve your eyesight naturally. It’s a new year and your resolutions may consist of getting your finances in line, working on a relationship, or obtaining something you’ve been working toward for some time. With this plethora of new goals, odds are, your days have gotten busier. But did you know that reserving 30 minutes or less out of your day for eye exercises can not only prevent your eye sight from worsening, but perhaps reverse eye damage? Here are 3 habits to build into your new year, new me, routine. Mud packs are not only relaxing, but highly therapeutic for your eyes. During allergy season, mud packs may become your new best friend––so grab a bath bomb, your favorite podcast, and take the next 20–30 minutes to unwind and improve your eyesight simultaneously. But how? Mud packs reduce irritation, itching, and relieve allergy symptoms by helping the muscles around your eyes relax. But maybe you are one of the few that skips through the springtime with complete relief from allergy season. Even so, mud packs are beneficial for you, too. Mud packs have the almighty power to help correct refractive errors like short/long-sightedness. Of course, consistency is key and it is recommended that this be done weekly in order to reap the benefits. WARNING: It is possible that your coworker might think that you are flirting with them or incredibly irritated with a project when doing these exercises––just inform them that you’re saving your eyesight. Just like the rest of your body, your eye muscles need to be worked out, too. Take 8–10 minutes of your day and perform the following exercises to keep your vision healthy and strong. It’s as simple as that. And while you’re probably confused by my suggestion of an exercise your body naturally performs, you might be surprised to know that there are specific times when you blink significantly less than you should. For example, according to studies, people blink one-third as often as they normally do when working for an extended amount of time on a computer. These are quick exercises that can be done anywhere for a short amount of time that create lasting results. Take 8–10 minutes to move your eyes in different directions. You can start with moving them up and down, then side to side, circles and figure 8’s. Take your time to complete each, and more than once if you need to. This should be relaxing. Pay attention to any “skipping” that might be happening and tap into your “Ujjayi breath,” a term used in yoga when focusing on breathing. Glasses aren’t only for fashion or for covering up a make-up-less face, they are a huge protector of our vision. 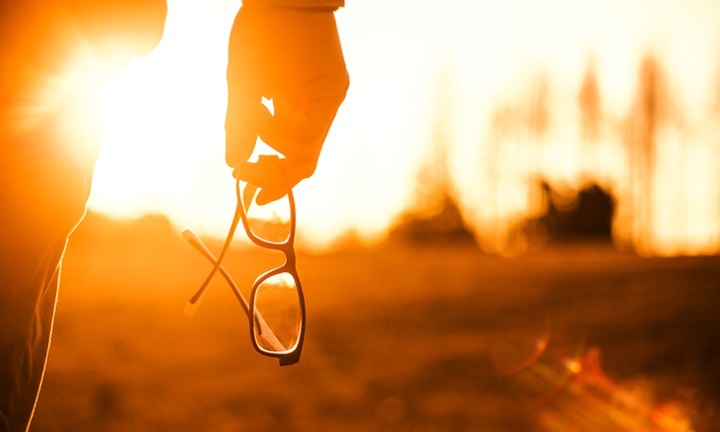 UV radiation can cause photokeratitis over a short amount of time if you are exposed to excessive amounts. You can think of it as a sunburn to the eyeball causing lots of discomfort and pain. Photokeratitis is one of the minor issues caused by UV radiation. Symptoms of photokeratitis are temporary and rarely cause permanent damage. Beware, UV radiation can cause long-lasting damage to your eyes if you do not take the right precautions. You risk developing cataracts or macular degeneration later on. It is recommended you wear sunglasses no matter the season when you are outdoors. If sunglasses aren’t your thing, there are contact lenses available that offer the same protection. Of course, an eye exam should be on your list of to-do’s in 2018 along with these tips and exercises. Take care of the things that allow you to enjoy all 365 days of every new year.